You just hired someone – now what? An effective onboarding program will dramatically decrease your turnover rate, save your organization money, and save the time and effort required to recruit and train new hires. Onboarding is a comprehensive process, not merely a series of short-lived orientation interactions. Join us for this 90-minute webinar to discover how to guide new employees through the first critical months of employment at your facility, ensuring a reduction in turnover and improving engagement. Live Question and Answer Session - Have your questions answered by an expert! This program has been pre-approved for 1.5 hours of General recertification credit hours through the HR Certification Institute. Use of the seal is not an endorsement by the HR Certification Institute of the quality of the program. It means that this program has met the HR Certification Institute's criteria to be pre-approved for recertification credit. 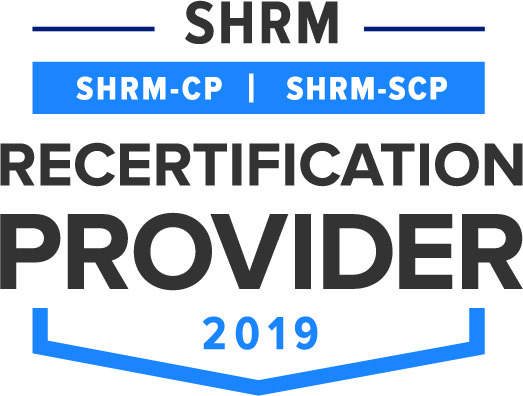 Park Avenue Presentations is recognized by SHRM to offer Professional Development Credits (PDCs) for the SHRM-CPSM or SHRM-SCPSM. This program is valid for 1.5 PDCs for the SHRM-CPSM or SHRM-SCPSM. For more information about certification or recertification, please visit www.shrmcertification.org. 90 minutes (Travel Free) delivered over the Internet. Unlimited listeners per connection - bring the entire department. Q&A session with the expert. This event will be presented live with a PowerPoint presentation to be viewed on your computer. You may listen to the audio of the webinar by telephone or through your computer. The PowerPoint slides will be provided shortly before the event. Once you register, you will receive an email which is your receipt and which includes your instructions for dialing in and logging on. You will also receive an email reminder 24 hours before the webinar. A webinar is a live Internet based seminar. Webinars are a way for participants in many different locations to see and hear a presentation and view PowerPoint slides. You can also have your colleagues attend the webinar using one connection. You will need a computer with an Internet connection (high speed service such as DSL or cable works best) and a telephone. You may listen to the webinar through your computer speakers, in which case you will not need to use a telephone connection. Internet access is not required for phone-only participants, but you will not be able to see the speaker’s slides. How can I share the webinar with my colleagues who may not be able to attend the event? CDs of each program will be available for sale and can be shared with your business associates. Can I get a copy of the PowerPoint slides used in the webinar? The PowerPoint slides will be available on the materials page link in the confirmation email that will be sent to you no later than the morning of the day a webinar is presented. How do I ask a question during the webinar? Will my question be answered during the presentation? A question and answer session will be scheduled at the end of each webinar. You can then ask a question by typing it into the question box that will be provided to you duringthe webinar. You may also ask a question through the telephone connection. As many questions as possible will be answered during the Question and Answer period.